McAfee Antivirus Plus 2011 is a powerful security suite which has been designed to protect computer from viruses, Trojans, rootkits, spyware, adware and other malicious items that may tamper PC. 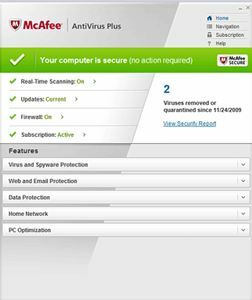 The McAfee Antivirus Plus 2011 has been featured with McAfee Active Protection technology to analyze and block new and emerging treats in milliseconds. Besides that, it also featured with Two-Way Firewall to block outsiders from hacking into the PC. Two-Way Firewall – blocks outsiders from hacking into PC. Anti-Virus/Anti-Spyware – detects, blocks, and removes viruses, spyware, adware and rootkits. McAfee Active Protection technology – instantly analyzes and blocks new and emerging threats in milliseconds. McAfee SiteAdvisor – helps user to know about a website’s risks before click to stop malware threats. Scan Time – rely on real time scanning to automatically protect against threats to PC. Home Screen – easily check the status of your protection, monitor how many threats have been blocked and manage your security from the McAfee home screen. Idle Timer and Scheduler – reserve security scans and updates for when you are not using your PC, for less disruptions. Alert System – Alerts are unintrusive and easy to understand. McAfee QuickClean – safely removes junk files that slow down your PC. McAfee Shredder – digitally destroys no-longer-needed sensitive files to prevent anyone from accessing them. Disk Defragmenter – get quick access to consolidate fragmented files and folders. Visit , click on the “Like” to be the fans of the McAfee. 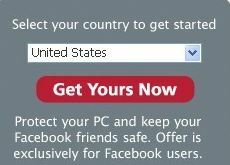 After that, select your country to get started and click on “Get Yours Now” button. 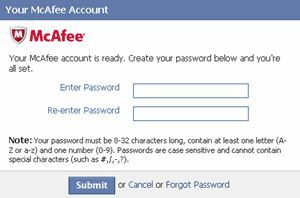 Allow them to connect to your Facebook account in order to create your McAfee account. Then enter password, re-enter password and click on the “submit” button. Click on the “Download” button to start downloading your free 6-month subscription.